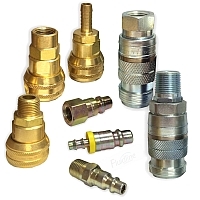 Pneumatic Disconnects by Hansen division of Eaton Corporation are available in the following industrial interchange sizes. Disconnects are also often referred to as socket, coupling, coupler, quick-disconnect, plug, or connector. Hose barb hose ID: ¼", ⅜"
Push-on hose ID: ¼", ⅜"
Body size: ¼", ⅜", ½"
Hose barb hose ID: ¼" thru ½"
Push-on hose ID: ¼" thru ½"
Hose barb hose ID: ⅜" thru ¾"